Uber is still the lead horse in the car-sharing race (ahead of Lyft and Sidecar for example). I’ve already written about when Google Drives Your Car. Now I can see that it is only natural that Google can drive you in Uber’s network of driverless cars. I had a flashback to the original version of the movie 1990 Total Recall. The movie (which was for my money much better than the 2012 re-make) featured several different interesting thoughts about the future. 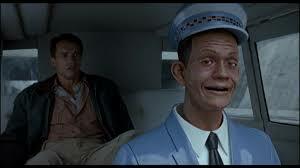 One of them (for those that can remember), was the ‘Johnny Cab’. Arnold Schwarzenegger’s character Douglas Quaid is driven by a robot that takes you wherever you need go whenever you need to go. While in the movie the Johnny Cabs were hailed the old-fashioned way, they just as easily could have been hailed using a transmitter (read app). After all, this version of Total Recall was made eight years prior to the founding of Google. The Uber app is easy to use and tracks an individual’s travel history and habits. Uber (Lyft and Sidecar as well) right now is primarily used as a taxi app. All the apps have now introduced ride-sharing capabilities within the app. Users are presented with the opportunity to spend less money (than a single ride) where you pick up or join another passenger as long as the trip does not take you more than five minutes out of your way. More than half the trips on Uber would apparently qualify as having two people in the same general area going to the same general place at any given time. It’s all about big data and Google is really good at monetizing big data. I admit that Google buying Uber is a pretty obvious idea. So why hasn’t it happened as yet? This entry was posted in Apps, Consumer Behavior and tagged Arnold Schwarzenegger Total Recall original movie 1990, Johnny Cab, Lyft.com, Ride-sharing apps, Sidecar.com, Taxi apps, Total Recall movie, Uber.com. Bookmark the permalink.